These online successes have given rise to an incredibly new marketing era... the one where businesses now have a lower cost form of advertising to utilise. While your typical celebrities seem out of reach to your small-medium sized business who can't afford an $100,000 minimum spend.. let's not forget that these were indeed the original 'influencers'. The PHLANX team is renowned for sifting through documentaries on celebrities, sports athletes and successful business men... and while we're not looking for celebrity placements, we like to learn what it took for those influencers to get to where they are today. 1) HE UNDERSTANDS OPPORTUNITY - "I always wanted to be great and I got the chance"
Usain views his success as taking the chance he was offered. He often talks about how people see him run and say how easy it looks and how it must be his raw talent "but before it gets to that point it's day in and day out sacrafice... dying... you just want to give up and go home... well you've got to go". Usain MATCHES opportunity with determination and his perception of 'chance' keeps him grounded. 2) HE'S LOST... A LOT! - "to know you're in great shape and then you lose... I was very frustrated"
Usain was eliminated with a torn hamstring in the Olympic Games in Athens, after ignoring advice not to run. In 2011 he false started in Daegu. However it was his persistence that got him to the Beijing Olympics where he won the 100m race as 3 billion viewers watched him smash the world record - a victory that made him the focal point of the games. Shortly after at the same Beijing Olympics he won the 200m AND the relay: 3 gold medals, 3 world records, an achievement still unparalleled today. 3) HIS DRIVE TRUMPS EXPERIENCE - "no one ever saw someone so young, do so well do early"
At just 15, Bolt became a star of Jamaican sprinting. His mother reports him crying on his very first National race because he didn't think he could win against the older competitors... the next morning, he ran the race and placed first. Usain realised at a very young age that it was just that, an age. His determination overshadowed his experience and lack of training at the time. 4) HE PUSHES HIMSELF TO THE LIMIT - "if he suffers a setback and has to train twice a day.. he'll do it"
Usain's coach Glen Mills attributes his success largely to his ability to push himself. He has the ability to focus. He doesn't have difficulty in understanding and assimilating instruction into action. He learns very fast. According to coach, these are all attributes of a star. 5) BEHIND THE SCENES IS WHERE THE WORK IS DONE - "the competition is the easy part"
Usain references the competition as the easy part, often talking about the behind the scenes work. His father doesn't like to watch Usain:"one day I was watching him train and he was vomiting... it's not easy to watch him train". The part that everyone doesn't see, that's the part that determines your achievement. 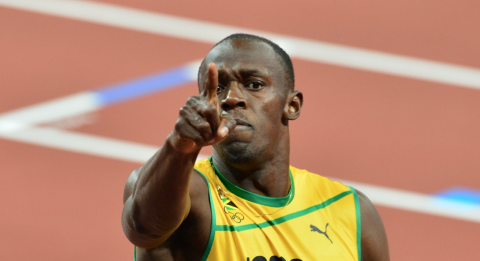 We all love a good international sporting icon and Usain Bolt is definitely worthy of that legacy. An influencer is arguably anybody who has the ability to draw, entertain and keep a crowd... and this particular one has us filled with drive! Quotes taken from "I AM BOLT" by Benjamin and Gabe Turner.